Thomas Crapper – yes thats where it came from. This former poet was the godson to Queen Elizabeth I, and although she liked him he was sent away for telling inappropriate stories. While away from the Court, he invented and installed the first ever flushing toilet. After reconciling with the Queen, Harrington showed her his invention which she was impressed by. Unfortunately, the flushing didn’t do more than get rid of the waste to a pan below the toilet so the invention never really took off. The English kept using their chamberpots until a working toilet that connected to real plumbing was invented. Yes, you read that right. There’s a very good reason you’ve heard someone say they’re going to the crapper. 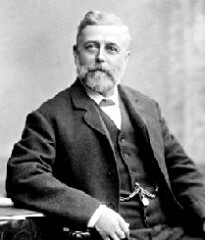 Thomas Crapper, another Englishman, was an apprentice plumber under his older brother and was the first man to really bring plumbing to the forefront of people’s minds. He spoke to anyone and everyone about sanitary plumbing and he later supplied the plumbing for Prince Edward VII. His company, Thomas Crapper & Co., supplied numerous toilets during WWII and since the company name was stamped on all the toilets, soldiers would say they were going to the crapper and everyone knew what they were talking about. William Feetham, another Englishman, was the first person to invent a mechanical shower. He was originally a stove maker from London, but he devised a contraption so people could shower. It worked by using a pump which forced water into a container which was placed above the head. A chain was connected to the container and when the person showering would pull the chain the water would drop down on them. Over the years the shower would improve greatly, with it eventually being connected to pipes bringing in the water and pipes draining the old water. There are too many names to even consider when it comes to those who improved on these inventions. However, due to our quest to be clean at a convenience, improvements are made constantly and continually. Take for example the water heater. It used to take time to reheat the water after you used up your supply, but now there are tankless water heaters which can give hot water on demand. It’s fun to just imagine what the plumbing improvements of tomorrow will include!